You know you are right for the administrative assistant job, but in a competitive job market, how do you convince hiring managers of the same? Employers often receive dozens of applications for a single open position, and many administrative assistants have very similar educational and professional backgrounds. How do you set yourself apart? The answer is simple: your resume. Crafting a stellar resume can be a challenge, but with our administrative assistant resume templates, the process is much easier. Continue reading to learn how our professional templates and industry-specific examples can guide you through the resume writing process until you have a stellar finished document that brings you one step closer to the job you want. Why Use Administrative Assistant Resume Templates? Our templates simplify the process of creating a top-notch resume, saving you time and energy so you can have a finished document in no time that is ready to wow potential employers. 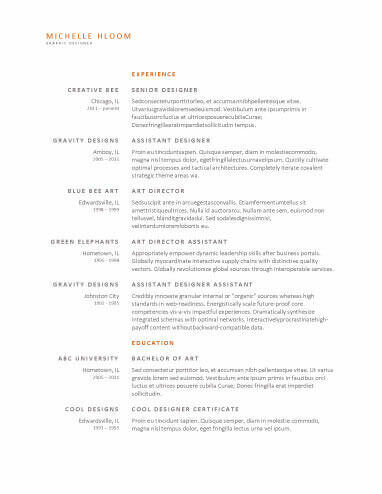 Create a simple yet appealing resume with one of our clean resume templates. They use minimalist layouts that optimize white space and pay special attention to font types and color schemes in order to create resumes that are both attractive and easy to read. Choose between more conservative looks or contemporary designs based on the job to which you are applying. Showcase your best qualifications with a sleek and up-to-date resume when you choose one of our many modern resume templates. They ensure that the font and layout of your document allow for easy skimming as well as machine readability. They also add a bit of color to give your document a current but professional look that does not bore employers. Emphasize your work history by using one of our chronological administrative assistant resume templates. These templates have formats that clearly portray the dates and duration of your previous positions, which illuminates your career growth and usually appeals most to hiring managers. Our selection features numerous designs so you can tailor your resume to the style you prefer. If you are just starting out in your career, have numerous gaps in your experience, or have changed positions many times throughout your career, take a look at our functional administrative assistant resume templates. Functional formats include your work experience but place more emphasis on your skill sets and accomplishments so hiring managers focus more on your strong qualifications than your weaknesses. Show off all of your strengths with one of our combination administrative assistant resume templates. These formats place equal importance on both your skills and work experience sections to ensure your document grabs and keeps the attention of potential employers. Our templates have styles ranging from traditional to creative so you can choose your favorite. Name: Write your full official name at the top of your document. Mailing Address: You do not need to include your full address. Your city and state is sufficient information. Email Address: List a professional email address, preferably one that includes your name. Telephone Number: Include a phone number that you regularly answer, but avoid listing a work number. Your resume should include either a summary statement or objective statement. Whichever you use, it is common to place it beneath your contact information. Summary Statement: This statement concisely details how your skill sets, experience, and other important qualifications will benefit your potential employer. It is a good idea to include a couple of keywords from the job listing in this section to emphasize your suitability for the position. Objective Statement: The objective statement is also concise, but its purpose differs from the summary statement. This section describes your professional goals and what you hope to gain from your new job if hired. Although most hiring managers prefer to see a summary statement, the objective statement is appropriate for some jobseekers, such as recent graduates or career-changing professionals. List: Display your top six to eight relevant skill sets using bullet points and short phrases. Identify Keywords: If you possess them, emphasize key skills listed in the job description. Tailor: Analyze the job description and research the company. Then, modify your language and content appropriately. Position and Employer: List official titles of previous positions, company names, and dates of employment. Responsibilities: Include three to six bullet points identifying important duties and responsibilities. Begin each line with an action verb and use numbers, percentages, and figures to make this section stronger. When you use this convenient resume builder, you also get to enjoy a number of benefits, such as keyword usage examples, writing guidelines for specific industries, and a cover letter builder. Start the process now — use our templates, resume builder, and useful advice to create a winning document.